Bundanoon has become the first town in Australia, and in the world, to stop selling bottled water to better care for the environment. This was a result of their “Bundy on Tap” campaign, which was affectionately named after the town’s nickname, and organized by local citizens. 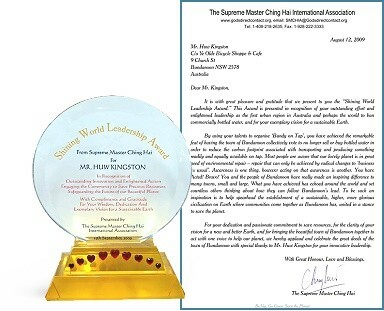 The campaign’s main organizer, Mr. Huw Kingston, recently received a Shining World Leadership Award from Supreme Master Ching Hai for his remarkable initiative and for playing a key role in this movement. 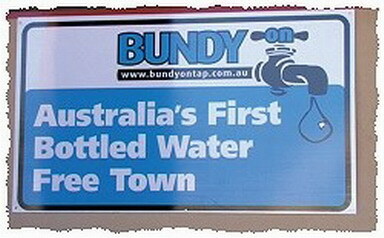 The “Bundy on Tap” campaign started after a bottling company sought permission to extract millions of liters of water from their district aquifer during one of Australia’s longest droughts. Many local people began to question the idea of trucking water some 100 miles north to a bottling plant in Sydney, only to transport it somewhere else, possibly even back to Bundanoon, for sale. At a meeting in July, Golden Year 6 (2009), the assembled crowd of well over 350 residents voted wholeheartedly in favor of banning sales of bottled water in the town. The community’s six food retailers agreed to pull bottled water from their shelves starting in September and the town has also installed four water refill stations, including one at the local primary school. According to Mr. Kingston, they have received literally thousands of emails from organizations around the world from Siberia to Brazil to Lithuania, saying “Good on you Bundanoon!” Quite a number of towns in Europe, the United States and Canada as well as places around Australia have been in touch asking, “How do we do what you’ve done? It’s an awesome thing!” Mr. Kingston thinks it’s important to preserve the planet because he wants the future generations to have the opportunity to enjoy the wonders of the great outdoors he has enjoyed. To those who want to make a similar change in their area, Mr. Kingston suggests, “I think the big decisions can be made at the bottom and they can flow up through small communities, then through bigger communities, after which the politicians have to take note of what the people want.” Let’s pray that everyone worldwide will be inspired by the progressive people of Bundanoon to quickly implement such earth-saving actions.